World Chess Champion from 2013 (at the age of 23) and No. 1 ranked player in the world. His peak rating is 2882, the highest in history. 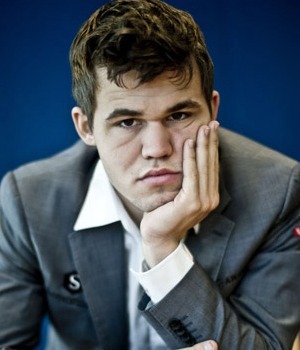 Carlsen is also the last World Blitz Chess Champion. Magnus Carlsen, became a grandmaster at the age of 13 years, 148 days, making him at that time the second youngest grandmaster in history. Magnus is included in Time Magazine`s 100 Most Influential People of the year and Business Insider`s most impressive people in 2013. He has been awarded Young Person of the Year 2013 by Times of London. Carlsen faced Fabiano Caruana in the 2018 World Chess Championship in London. All 12 classical time control games were drawn. Carlsen retained his title by defeating Caruana 3–0 in rapid tiebreak games. Carlsen won three times “Shamkir Chess” tournament dedicated to the memory of Vugar Gashimov.